Savor the spaghetti sauce with Neufchatel cheese, tossed with bow-tie pasta and served with chicken breasts simmered in a robust dressing. Cook pasta as directed on package, adding broccoli to the cooking water for the last 3 min. of the pasta cooking time. Meanwhile, heat dressing in large nonstick skillet on medium heat. Add chicken and garlic; cook 5 min. Turn chicken over; continue cooking 4 to 5 min. or until chicken is cooked through (170ºF). Drain pasta mixture in colander; return to pan and set aside. Add pasta sauce and Neufchatel to chicken in skillet; cook on medium-low heat 2 to 3 min. or until Neufchatel is completely melted, mixture is well blended and chicken is coated with sauce, stirring occasionally. Remove chicken from skillet; keep warm. Add sauce mixture to pasta mixture; mix well. Transfer to six serving bowls. Cut chicken crosswise into thick slices; fan out chicken over pasta mixture. Sprinkle evenly with Parmesan cheese. 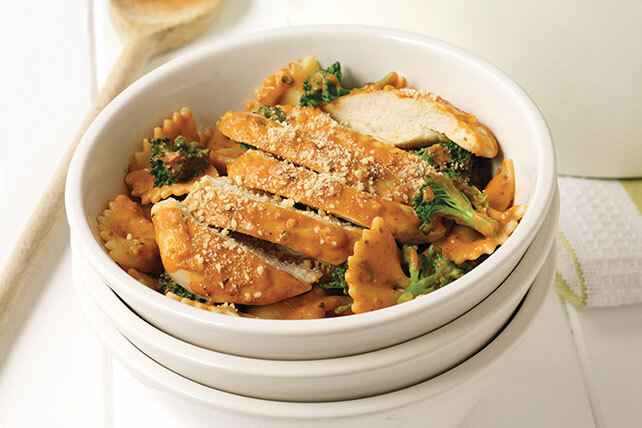 Prepare as directed, using whole wheat or multigrain pasta.